Early in the morning we loaded a sleepy Jacob into the car, dropped off our dogs with the sitter, and drove on up to DISNEY! 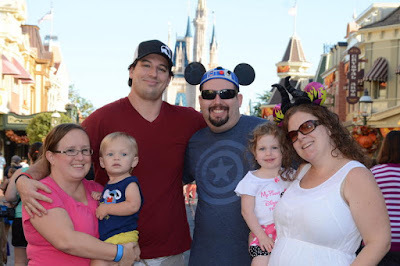 Once we checked into the hotel we did a quick change into your first disney shirt from Jen's Coastal Creations and took the bus on over to meet up with our friends at the Magic Kingdom! The first ride we tried was the Little Mermaid ride. Fantasyland has been completely redone and expanded since Mommy and Daddy last came so this ride was new to all of us! You liked most of the ride except for Ursula's lair where it was very dark. Next we tried Dumbo. We were a little nervous this one would be too much for you, as you cried on similar rides over the summer. We spent our time in line pointing to the ride and saying "ooh" and "wee" in hopes it would convince you that it was fun. Turns out a few months makes a big difference, and you loved it! You said weee the whole time and clapped when it was over. Then it was time for a snack! We got two of our favorites, popcorn and nuts! Then we went on It's a small world, and as much as we hate the song you loved looking at all the dolls! After Small World we grabbed some lunch in Tomorrowland at Cosmic Ray's Starlight Cafe. You were more interested in the animatronic band, than in eating! 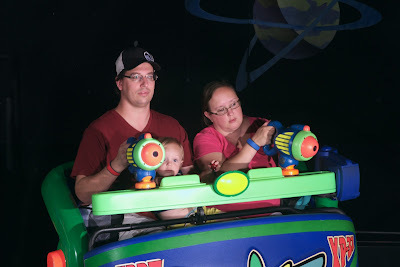 After lunch we rode Buzz Lightyear's Space ranger spin where you sat in between us and spun us around while played lazer tag. You must have been Daddy's good luck charm because he beat mommy for the first time ever. Then it was time to head back to the hotel for a nap. You loved having room to run around while we waited for the bus. When we returned in the late afternoon we went on the people mover. You loved riding around in the little train! After the people mover we grabbed some dinner at Pecos Bill's Cafe. You and Allison did some coloring while we waited for the food. After dinner we rode Aladdin's Magic Carpets. You loved this one as much as Dumbo. You loved pushing the button to make us go up and down. Luckily we avoided the spitting camels. Then we had some Dole Whips and did some shopping on Main Street before heading back to the hotel for bedtime! Back at the hotel you passed right out after your busy day! This trip was much more low key and slower paced than Mommy and Daddys previous trips before baby, but it was special to get to take you for the first time and meet up with friends.